Be the first to review this 2018 Honda Odyssey. The safety features, specifically the adaptive cruse and lane warning features, are outstanding. The backup camera and vehicle approaching warnings are very good. Comfort in the front and second row seats is very good as is the sound system. The ability to listen to music while the kids watch a video is very nice as is the in-cabin camera. Overall a great car. I like the Odyssey for convenience and comfort with 3 kids. However the technology could be better as the only way to operate the blu ray player is from back seat with attached remote control. With toddlers it's key to be able to operate it from the front for safety reasons. 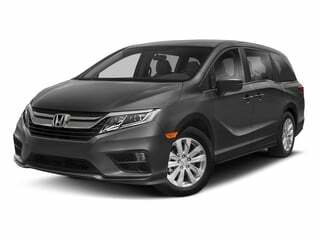 Completely redesigned for 2018, Honda Odyssey is an eight-passenger minivan with class-leading power, space, technology, comfort, handling and fuel efficiency. The new Odyssey has been thought out extremely well, and can carry a family even better than before, with its standard 60/40 folding third row seat, and many safety features. It was seriously challenged last year by the new Chrysler Pacifica, and has responded by upping its game. A new 3.5-liter V6 engine makes 280 horsepower, which is 32 hp more than before. So it’s faster, the chassis is stiffer, the steering quicker, cabin quieter, and there are two new automatic transmissions, a nine-speed and ten-speed. New features include a sliding rear seat with removable middle section and removable outboard seats that slide sideways as well as forward or back. With just the middle seat removed, it’s like captain’s chairs. Four kids with that setup is perfect. Can carry eight when needed. Can carry refrigerator when needed. A canoe will fit on the roof. There is a new 4G LTE WiFi hotspot that can drive the rear entertainment system, a wireless charging pad for smartphones, Apple CarPlay and Android Auto. There’s another optional new feature that allows parents to watch their kids like a hawk, in the big screen on the dash, zooming in with infrared vision, so there’s no hiding in the dark, they are doomed. Odyssey EX ($33,860) features dual power sliding side doors, as well as the Magic Slide second-row seats that slide in four directions. The driver’s seat adjusts 12 ways and front seats are heated. EX also adds three-zone automatic climate control, a display audio system, Apple CarPlay and Android Auto capability, HD radio, HondaLink apps connectivity, the CabinControl app that lets occupants control the climate system and send songs to the playlist from their smartphones, automatic headlamps, heated door mirrors with turn indicators, foglamps, and remote starting. EX also adds safety features, including blind-spot monitors with rear cross-traffic alerts and automatic high beams, plus the Honda Sensing package, which includes adaptive cruise control, forward-collision warnings with automatic emergency braking, lane-departure warnings and active lane control, and road departure mitigation. Odyssey EX-L ($37,360) upgrades to leather upholstery, auto-dimming rearview mirror, garage door opener, sunroof, and power liftgate. Odyssey EX-L with Navi/RES adds navigation with voice recognition, a Blu-Ray rear entertainment system with wireless headphones, 115-volt power outlet, and Honda’s CabinTalk system that allows the driver to talk to all passengers through the speakers or headphones. Odyssey Touring ($44,510) gets the new 10-speed automatic transmission, stop/start technology, Honda’s CabinWatch feature that points a camera at any seat in the vehicle and lets the driver see the image on the center screen, 4G LTE mobile hotspot capability, an in-vehicle vacuum cleaner, third-row sunshades, a hands-free power tailgate, LED headlights, LED fog lights, and front and rear parking sensors. Odyssey Elite ($46,670) upgrades further with an 11-speaker audio system, wireless phone charging, a heated steering wheel, heated and cooled front seats, ambient lighting, gloss black interior trim, rain-sensing wipers, power-folding exterior mirrors, and 19-inch wheels. Available safety features include automatic emergency braking and forward-collision warnings, blind-spot monitors, active lane control, and adaptive cruise control. Every model gets two knee airbags in front, as well as a camera for the driver to keep an eye on his or her passengers. The face of the Odyssey shows a family resemblance to the Pilot crossover and Civic sedan. Behind the big chrome grille there are shutters to improve the aerodynamics and increase fuel mileage a bit; at the edges of the grille there are LED running lamps. LED headlamps and foglamps come on the Touring model. The redesign to styling features a deep swoop carved into the front and side doors. The channels for the sliding rear doors are relocated under the third-row glass, to better conceal them. The new Odyssey brings softer materials into the cabin, including a new stain-resistant leather on EX-L and above. The center console is massive, functional if not pretty, with two main storage areas, one of them deep and the other wide and flat. There’s a digital instrument display and clear touchscreen on the dash. The new optional CabinWatch appears on the screen, a running video feed of the rear seats, so parents can literally keep an eye on them. Mom and Dad become Big Brother. And get this: it’s infrared, and can zoom in, so Dad can play sniper. The rear seat entertainment system is upgraded. The 10-inch screens have 4G LTE, with apps like PBS Kids, iHeart Radio, Spotify, and more. There’s even an app called “How Much Farther,” that maps the van’s path to the destination. Another app allows passengers to use their smartphones to control their entertainment screens and climate control, and send music to the sound system and destinations to the navigation system. Honda’s Magic Slide seating system was re-engineered for the new Odyssey. The second row is composed of three sculpted and roomy seats that can be moved separately. The middle seat can be removed to create captain’s chairs, and a path to the third row. The two outboard seats slide up, back, left, right; or they could be pushed together. And they can be moved with a child seat remaining attached. But what if you sometimes need a flat floor and cargo space? You remove the second-row seats that weigh 70 pounds each, and store them in your garage, or somewhere. Not quite like the Chrysler Pacifica’s Stow ‘N Go system, whose rear seats fold flat into the floor. If you do get those seats out of there, the Odyssey has the most cargo space in the class, 144.9 cubic feet. Better than that, it has mucho cargo space behind the second row, 86.6 cubic feet. That’s with the third row folded flat, which it easily does with a tug on a strap and a flop. With its many configurations, you can custom tune your family minivan to be what you need for each trip, project or adventure. The new Odyssey has been silenced, by acoustic foam sprayed into 14 spots were noise might leak through, then a barrier carpet, thicker glass all around, triple door seals, and noise cancellation under the hood. Quick and controlled, Odyssey is the best-driving minivan. The changes for 2018 hammer it home. Torsional stiffness of the chassis has been increased by 44 percent. It sounds esoteric but its intuitive. Do you want your chassis to twist, or not twist, when you’re going around a corner? Now it twists 44 percent less. The platform design takes from the Honda Pilot and Acura MDX, and comes away losing 75 pounds. The electric power steering is quicker, which it can be thanks to the stiffer chassis. The rear suspension adds a stabilizer bar, to keep up with the steering and chassis improvements. The Odyssey handles with control and confidence. The suspension is more stable than a minivan has a right to be. The Odyssey sometimes feels like a crossover, not a minivan. The ride is smooth, although not as smooth as the Pacifica. The new 3.5-liter V-6 makes 280 horsepower. Honda brags that its zero-to-sixty time is one second faster than any other minivan. Maybe it is quicker than the Pacifica, but Honda’s nine-speed automatic is nowhere near as good as the 10-speed automatic that shifts smoothly and responsively, and uses all 10 gears seamlessly. Unfortunately, only the Touring and Elite models get the 10-speed. The Honda Odyssey leads the minivan class. If you don’t spend the big bucks for the Touring or Elite models, you’ll miss the sharp transmission, but you’ll still have the oomph, out of the new V6. CabinWatch might be fun if you have kids. 2018 Honda listings within 25 miles of your ZIP code. Find 2018 Honda listings for sale near you.